Hua Hin has its own Fringe Festival. After last year's joint staging in Bangkok and Hua Hin, the beautiful beach resort is now the only venue. With artitsts and performances from all over the world, and of course Thailand, this year's program is unique and has something for everyones taste. The current Fringe Festival runs from 12th November 2011 – 25th February 2012. 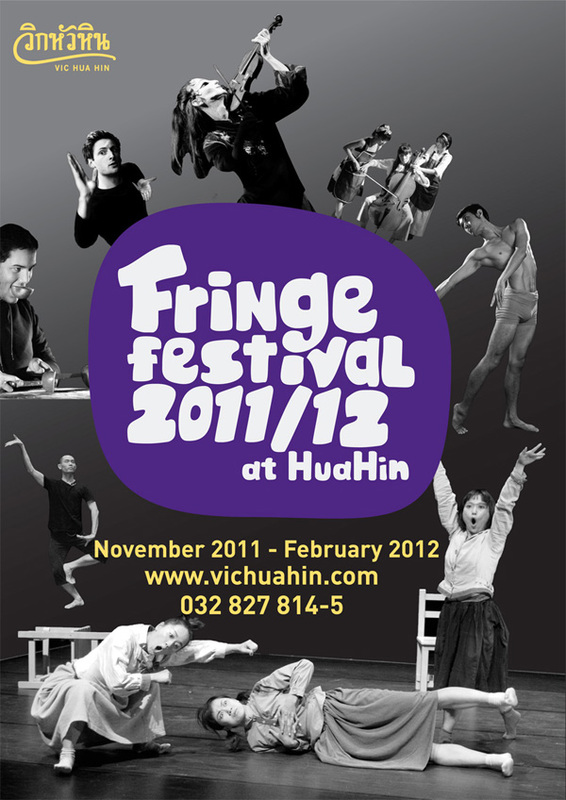 The Fringe Festival 2011/12 will be held at the amazing venue, Vic Hua Hin, under the guidance of artistic director Khun Patravadi Mejudhon. It is supported by the Office of Contemporary Arts and Culture at the Thai Ministry of Culture. The festival will begin on the 12th November 2011 with the Japanese Contemporary Dance Theatre's rendition of "Three Sisters“ by Pappa Tarahumara. It revisits Anton Chekov’s literary classic, set in rural Japan during the 1960s. This performance is supported by the Tokyo Metropolitan Government. Khun Patravadi's own production, "Phra Lor" will be performed twice: 19th November at 7.30 pm and on 20th November at 6 pm. It is an epic love story, written in poetic verse by one of the kings during Thailand’s Ayudhya period. Over the centuries there have been many songs composed using the poetry from this book as lyrics. We would like to present some of these in this production, with a new interpretation, featuring a modern generation of artists playing both Thai and Western musical instruments. Written, directed and performed by Khun Patravadi herself. For December 3rd we have invited the Urban Bones Dance Company from Bangkok to do three pieces: "Entre-mains", "Haiku" and "Morphoses". The evening called "La Danse" shows the richness of French choreography and its heritage from the 20th century. On Christmas Eve, Vic Hua Hin and the Patravadi High School Hua Hin would like to invite you to spend a couple of hours with Christmas songs, turkey, students performances and the magic ambience of X-Mas Eve @ Vic Hua Hin - starting at 6 pm, December 24th. Donations for our scholarship fund for young performing artists are greatly appreciated. Returning to the Fringe Festival is Yael Rasooly and the Golden Delicious Theatre from Jerusalem, Israel. The show will feature three object theatre pieces in one evening, January 21st 2012. This performance is supported by the Israel Ministry of Foreign Affairs. Another Thai production will be presented on February 4th, with B-Floor from Bangkok. "Taste of Curry" combines live music and a story about cooking with a shattering look at life in all kinds of languages: Thai, English, French, Gibberish; and of course physical movement and live music to present the full taste of life! Our next guest travels from the UK to Thailand to perform his one-man piece "SPACE". Timothy Mann is an actor, writer, musician and video editor who joined the theatre company Nose2Nose in 2006. He will ask the infinite question, "What is SPACE?"... and maybe also find an answer. A co-production with the Festival La Fête, Bangkok, will be the final event of the Fringe Festival: "Pichet Klunchun and Myself", performed by the French artist Jérôme Bel and the Thai dancer Pichet Klunchun. We will see a combination of traditional Khon and modern Dance, to close the festival on February 25th 2012. 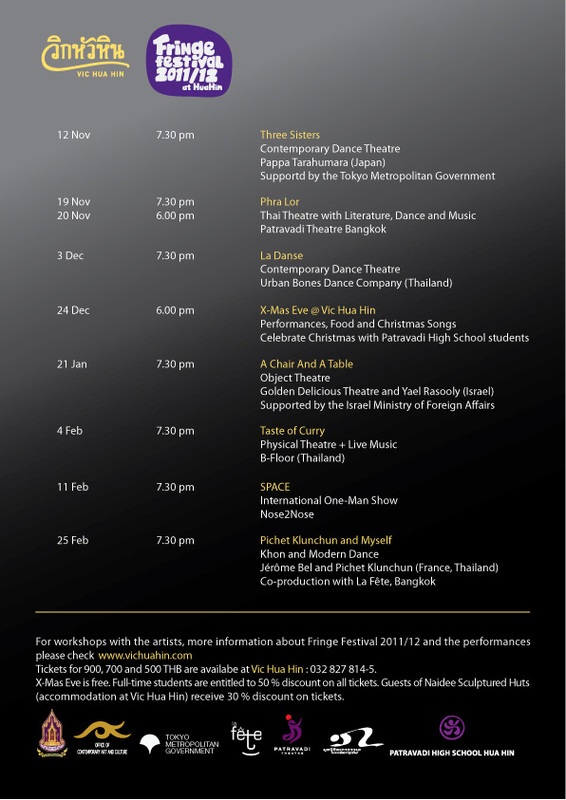 All performances of the Fringe Festival 2011/12 at Vic Hua Hin start at 7.30 pm, except the second performance of "Phra Lor" and the X-Mas Eve celebration. For more information please check www.vichuahin.com. Tickets for the events are available at Vic Hua Hin or call for reservations now: 032 827 814-5.